Margate Movers – There are many things that have to get taken into account when moving. A good moving company can guide you through the process and help with the planning in addition to the actual moving. Discount South Florida Movers has been helping people with their moves in the Broward County area since 2001. We put the customer first and guarantee you will be happy with your move. Margate is a medium sized city of 53,000 carved out of the Everglades in Broward County. The city was founded in 1950 by Jack Marqusee and soon after experienced a population boom leading the city to incorporate in 1961. Although not a large city, the city is served by two charter schools, the Somerset Preparatory Academy and RISE Academy. One of the biggest attractions in the city is their water park, Calypso Cove. The city also has two golf courses, Carolina Gold Club and the Oriole Golf and Tennis Club which also boasts a tennis court. Singer and actress Kaye Stevens made her home there for 45 years. 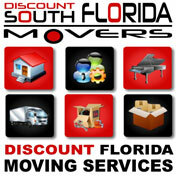 Discount South Florida and Margate movers provide low rates on residential, commercial, piano and long distance moving.